We Southern folks have had many long-standing practices that have slowly but surely changed as the years have gone by, and one of the traditions that is rarely ever practiced anymore is sitting up with the dead. Some may think this is a rather morbid topic to write about, but it has been a part of our culture, and in the not too distant past, was always conducted with the passing of a loved one. For historical purposes, I am of the opinion that it should be preserved in writing. The late Barney Seber had a theory as to how the practice of sitting up with the dead began. He said that in the days before funeral homes came into existence, one of the reasons people sat with a deceased person was to keep rodents away. And after doing research for this story, I’ve come to the conclusion that this could very well be true. 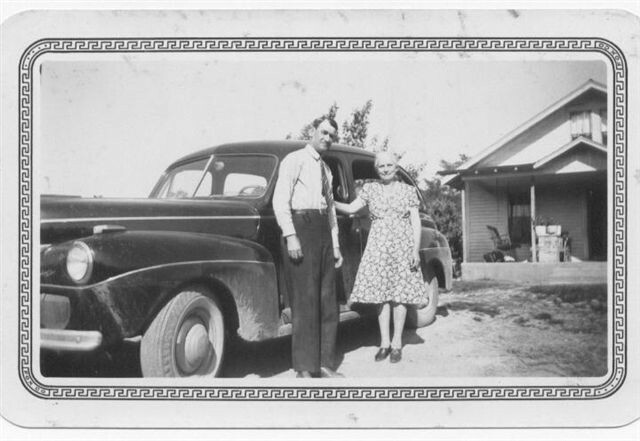 During the 1920's and 30's, in the community of Highland Mountain in Overton County, certain individuals could be called on to do services for their neighbors free of charge. If the men in that area needed a hair cut, they knew exactly whose door to knock on for that service. If someone had a toothache and needed a tooth pulled, there was a specific person who did that also. When a loved one passed away, there were two couples who worked together to construct and dress a casket for the funeral service. Those people were W.E. Ledbetter and wife Florence Stout Ledbetter, and Shirley Walker and wife Auda Ledbetter Walker. W.E. 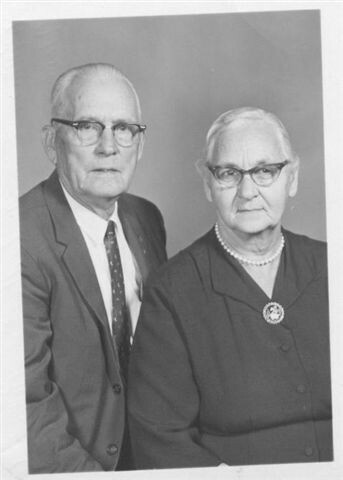 Ledbetter and Auda Ledbetter Walker were brother and sister. The men did the building of a casket, and the job of lining and dressing the inside as well as the outside of the casket was done by the women. The material used for the building of a casket, the labor involved, including the sewing, the batting and fabric used, was not something the family of the deceased person paid for. It was all done without any expectation of money exchanging hands. Neighbors helping neighbors was a way of life then. W.E. Ledbetter and wife Florence assisted many families who lost loved ones during the years they lived on Highland Mountain. On some occasions, lumber had been put away for the purpose of constructing a casket. A very fine casket could be made from cherry lumber, and if that kind of wood was used, the deceased person was a little bit better off financially than most folks. Most of the time, it was pine or poplar that a casket was made from. The inside of the casket was always lined with cotton batting. Cotton was raised by both the Ledbetter and Walker families, and then processed by hand for the lining. The cotton batting was covered with fabric which most often was crepe. Gray velveteen was used for the outside of a woman’s casket. Supplies such as the velveteen and crepe fabric were items that were always found on a shelf in the general store on Highland Mountain. During snowy, cold winter days, the building of a casket had to be done inside the home. Some of the younger family members often felt uncomfortable watching a casket being built in the middle of the front room or the kitchen, and would try to avoid being in that room if it were possible. Sometimes when a death happened, there might not be any lumber on hand, and as a result, a nearby sawmill might have to work until very late hours, or even all night, in order to provide the necessary lumber. The body of the person who had passed was never left alone. During the process of preparing the body for placement in the casket, it would sometimes be necessary to put buffalo nickels on the eyes in order to keep them closed. Food was brought to the home of the deceased person by neighbors, and those who came to sit up were always invited to partake of what had been brought in. Most funerals the Ledbetter and Walker families helped with were held at a cemetery. There were occasions when the funeral was held in the home of the person who had passed away. The graves were all hand-dug, using picks and shovels. And again, this was usually done by neighbors. This task was especially hard during the really cold winter months. At some funerals, as many as three preachers took part in the service. This type of service could sometimes last a very long time, with most of the preaching directed at saving a lost soul, rather than remembering the life of the one who had passed away. Part of the grieving process would sometimes include very loud hollering and in some instances, screaming would be done, mostly by female family members. Should a woman who was not a blood relative overreact during this time, she might be whispered about, and critical remarks such as "she was only a sister-in-law" could be said about her. I was told that on one such occasion, a board in the front porch of a home fell through with a "sister-in-law" who carried on a little too much. I recently sat down with Bob Arnold of Livingston, a licensed embalmer and funeral director, now retired, and we reminisced about events and stories he recalled from his days of employment in the funeral business. Holding funerals in the home of a deceased person was a common practice during Bob’s career. Many times, the embalming of someone who had passed away was also performed in the home. The procedure started with the bathing of the body. Bob explained the process to me from that point on, but I don’t believe I’ll include those details here. Often families wanted a homemade casket, so the person who had passed away was "laid out," usually on a bed in the home, or sometimes on boards, and remained there until the task of getting the casket constructed was completed. Speck and Hyder Funeral Home where Bob was employed after moving to Livingston had at least two men on their payroll whose job it was to dig the graves which, as explained earlier, were all done with picks and shovels. On some occasions, family members would dig the grave of a loved one. After the completion of the "laying out" process, family members, friends, and neighbors would gather at the home of the person who had passed away, or if the deceased person was taken to the funeral home, they would gather there. The body was not left alone prior to being buried. Someone stayed around the clock. Prior to having air conditioning, decorative veils were sometimes draped over the casket. These were most often used in hot weather when the deceased person’s body was kept at home prior to the funeral service. Veils were useful in keeping pesky flies away. During summer months when windows and door were kept open for air to circulate, someone with a fly swat would sometimes stand near the casket and make use of the fly swatter. When Bob began his career, funeral homes not only took care of burying the dead, but also ran an ambulance service for areas that included surrounding communities. Ambulance service as we know it today did not exist. Most of the time when Bob was called out to transport someone to a hospital in Nashville, he went alone. On some occasions, he would be accompanied by a family member. He remembers a trip he made once shortly after the funeral home had purchased a new ambulance. Prior to leaving Livingston, the gas tank was filled up, however after reaching the Lebanon area, Bob happened to notice that the gas hand was on empty. He couldn’t believe it could possibly be right, and thought that maybe the gas hand was faulty. He continued on the journey, and it wasn’t too long until the engine died. He pulled over the side of the road, leaving the red light on the ambulance flashing. It wasn’t but just a short time until some men in a moving van stopped to see if there was something wrong. Bob told them what had happened, and one of the men crawled underneath the ambulance and found that one of the fuel lines had come loose, allowing the gas to slowly leak out. This fellow was able to repair the fuel line, and in the meantime, the driver of a tanker truck stopped to see if he could help. After he learned what had happened, he managed to empty out about a gallon of gas from the hose of the tanker truck. This was enough to get the ambulance to a gas station not too far down the road. The journey from that point on was made without additional problems, and the patient was left safely in the care of personnel at a Nashville hospital. Bob remembers another occasion when he was called out to the scene of an automobile accident. The car had crashed down a really steep embankment, and folks who came along after the accident happened didn’t know if the driver was trapped inside, or what the situation was. That required Bob to climb down to the vehicle, which was no easy feat. He made it down safely, but upon checking out the vehicle and the area nearby, he determined that the driver was gone. He told me it was hard enough to get down that steep bank, but coming back out was even worse. Occasions like that had to be dealt with since it was all part of his job. Prior to moving to Livingston, Bob was employed in Chattanooga. While he worked there, the funeral home was called upon to transport a man who was a victim of polio. The man was kept alive through the use of a respirator, and to be able to transport him would require some very carefully planned procedures. A U-Haul trailer was rented in which a generator was placed to provide the necessary electricity for the respirator. It was hitched to the back of the ambulance, and inside the trailer, an employee from the power company rode along. As a back-up plan, the trailer also carried a heavy duty, extra long extension cord that would be used in the event the generator failed. If that happened, this very unusual caravan could stop along the road at a home or business and plug in the chord to keep the flow of electricity going. The transport of the polio victim was accomplished without any difficulty, and thankfully, the back-up plan was not needed. On another occasion, Bob accompanied Bill Veal, who was also an employee of Speck Funeral Home, to pick up the body of a lady who had passed away. The call for an ambulance came in around midnight, and at a time when the area had been having several days of nothing but rain. The home was located in a remote area of the county with a long and very muddy lane leading up to the house. After getting the woman’s body loaded into the ambulance, the journey back down the muddy lane began. Because of all the rain and mud, travel was not easy, and the ambulance got stuck. It was necessary to get someone in the neighborhood with a tractor to come and pull the ambulance out. This wasn’t anything that could be considered unusual, but wait until you hear the rest of the story. Prior to having the funeral for this particular lady, another call came in, again, around midnight, advising that the father of this lady had also passed away. Again, Bob and Bill made a second trip to the home, this time, to pick up the father. The muddy lane was still very slippery from all the rainy weather, and again, much to Bob and Bill’s dismay, the ambulance got stuck a second time. The help of the neighbor with the tractor was needed again to pull the ambulance out. A joint funeral service was held for the daughter and father. Grover Brown with Speck Funeral Home here in Livingston told me that sitting up with the dead is a tradition that doesn’t happen too often anymore, maybe once of twice a year at the most. And we can certainly say for sure that the days of conducting the entire procedure necessary to bury a person, all done by caring neighbors, with no charge involved, are no longer practiced. I attended a funeral not too long ago for the mother of one of my best friends. The daughter chose to have a private burial before the funeral, one reason being that her mother’s sisters in attendance were not in good health, and did not need to be exposed to the cold winter weather at the cemetery. During the memorial service held in the afternoon, a display of her mother’s beautiful handwork was included. Handmade quilts and beautiful embroidery work were arranged at the front of the sanctuary. It was a wonderful tribute that highlighted a special talent in a very nice way, and made a lasting impression on everyone attending. That’s another example of how traditions and ways we’ve done things are changing, slowly but surely, and probably for the best too. Do you suppose that in as little as 25 years from now, folks will look back on how we did things and think we sure had some quaint ways of putting our loved ones to rest? My guess would be that they will.